Falluja residents have been returning to their homes for a second day since US and Iraqi forces began allowing people back into the devastated city. They arrived amid reports of sporadic clashes, adding to the 900 civilians who returned to one of the safer areas on Thursday. The numbers of those returning are much smaller than anticipated. Most of Falluja's 250,000 people fled fighting in April and November, and the city has no running water or power. 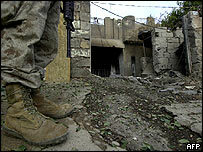 The Iraqi government had authorised a group of 2,000 to return to inspect their homes in the Andalus area. It is one of 18 districts in the west of the city, which is said to have seen less destruction than other neighbourhoods. Many of those who have inspected their homes say they do not intend to stay. "I saw the city and Andalus destroyed," resident Ali Mahmoud told Reuters news agency on Friday. "My house is completely destroyed. There is nothing left for me to stay for." At checkpoints outside Falluja, Iraqis of military age are being fingerprinted and having their irises scanned to try to ensure that no insurgents are returning. Sporadic clashes were reported in many parts of the city as residents returned on Thursday. It was a bad beginning to what may have been intended as a showcase event to bolster confidence in the run-up to next month's elections, says the BBC's Jim Muir in Baghdad. 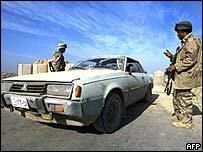 AFP news agency reported more fighting on Friday, prompting some cars waiting at checkpoints to turn back. Friday also saw US Defence Secretary Donald Rumsfeld pay a visit to a US base outside Falluja. Many civilians who fled Falluja have said they are desperate to return. Many have been camping out in winter temperatures in tents, or staying in schools and other public buildings. The initial group of 2,000 people is part of a staged return that is expected to last a few weeks. The government says it has set up water tanks for them in the city, and will give each returning resident $100. It is also promising to pay compensation to the many whose homes have been destroyed or damaged.